Copper moonshine still kit,upgrade style with controllable valve! 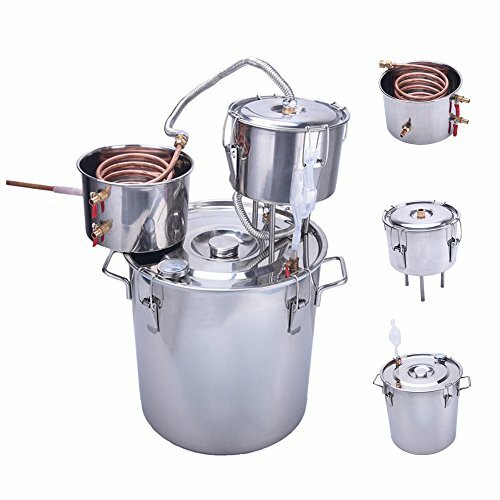 Material: red copper + stainless steel;all stainless steel construction and welding technique - avoid any health problems associated with copper and solder constructed stills. Multifunction:can be used for distilling fruit wine, distilling water, purifying water, distilling brandy,etc. Thumper keg - new thumper, perfect for adding flavors to your product! use any fruits or flavoring. If you have any questions about this product by Seeutek, contact us by completing and submitting the form below. If you are looking for a specif part number, please include it with your message.